NEW YORK, Jan. 22, 2019 /PRNewswire/ — The European Table Olives Campaign, brought by P.E.M.E.T.E., continues the promotion of European Olives in the United Arab Emirates by implementing their second year of actions with the goal of strengthening its image in the United Arab Emirates market. The following promotional campaign launches in January 2019. The internationally acclaimed Chef Uwe will present 10 recipes based on olive-inspired recipes to student chefs and professionals. The recipes will cover the multi-ethnic eating habits of the population of Dubai. The attendees will have the opportunity to learn how to make the recipes, receive hard copies of the recipes and also have the opportunity to taste the dishes. Furthermore, the widely known dietician Victoria Tipper will be joining the seminar and will explain the high nutritional value of olives in our daily diet. Venue for the seminars: Radisson Blu Hotel, 476 Baniyas Road, Deira, Dubai, in a specially formed room where classroom setting will have been arranged. Implementation Dates: Jan. 27, 2019 – 11 a.m.-2 p.m. AND Jan. 28, 2019 – 11 a.m.-2 p.m.
Advertising will take place on a specially lit, three-axle promotion truck which showcase the graphics of the campaign on the three sides of the truck (two on the sides and one at the rear part). The van will be driving around the city for three weeks/eight hours per day in Dubai and will “support” the rest of the actions of the campaign throughout the city with its existence. About S/M Chain: SHJ COOP is the well-known Coop chain which manages Spar – Metro-Coop in the UAE. This action includes promotion and tasting of various European Olives in restaurants. The promotion will take place at five restaurants for the duration of four weeks, totaling 20 weeks of promotion. It is noted that restaurants within hotels have been selected because on one hand they are luxurious and on the other hand they have permission to serve alcohol so that olives can also be used in cocktails. The customers will have the chance to taste European olives as a starter. 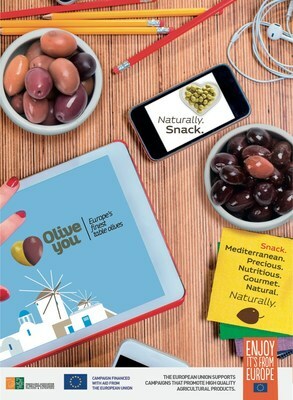 Every restaurant will showcase a special frame with the “Olive You” logo. The three restaurants are located inside the Radisson Blu Hotel – Baniyas Rd.